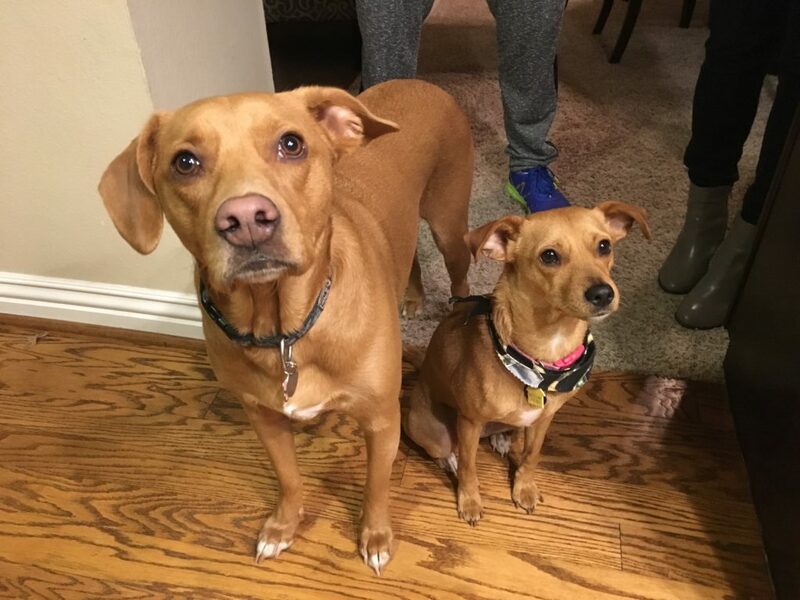 Abbey (right) is a two-year-old Terrier mix a who was rescued by Mae Day Rescue in Los Angeles. She lives with a three year old Ridgeback mix named Penny. The guardians asked me to come out for a dog behavior training session to help Abbey with some potty training issues. After welcoming Abbey into their home, she started to urinate on the concrete outside the dog door instead of the artificial grass they installed for that purpose. The guardians hired a dog trainer to help with the issue, but instead of stopping the dog from going on the concrete, she started to have accidents in the house too. After a few months of this behavior, Mae Day Rescue’s founder Natalie suggested that the guardians call me in to stop the accidents in the house. The dogs showed good curiosity when I arrived for the session, although they did jump up on me a few times. I sat down with the guardians to discuss the dogs day-to-day routine and observe how they interacted with the humans. The dogs did not show a lot of control and consistently invaded or jumped up on their guardians anytime they wanted attention or affection. It wasn’t hard to see why, each time they jumped up, the humans started to pet and caress the dog. I never like to say that petting a dog is a bad thing, but if we pet the dog on demand in this fashion, we can give them the impression that they have the same authority that we do. If a dog thinks it has the same authority than you do, then listening to you becomes optional. Also, they start to think of your home as their’s in terms of ownership. If the dog thinks its their house and prefers to pee somewhere, they will do so. As a dog behaviorist, I have found that when you have a dog that thinks it has the same authority as a human, changing its perception of authority is a crucial first step that is necessary anytime you want to change or modify behavior. One of my preferred ways to help a dog start to identify as a follower and also develop more control is to start delaying gratification. There are many ways to do this. I share some dog training secrets to this problem in the video below. Throughout the day we have many opportunities to ask a dog to stop and wait before we give them what they want; feeding time, leashing them up for walks, petting them, giving them treats, throwing the ball, etc. I recommended that the guardians look for these opportunities and start asking the dogs to wait before they are given permission or what they want. At first they need to keep the delay short. But once the dog is able to control itself for a second or two, we can start increasing the delay which helps them further develop their self control. After suggesting some rules, structure and some nonverbal communication cues, I was ready to address the primary issue that I was called in to fix; adult potty training with Abbey. By providing Abbey with a jackpot of treats anytime that she goes potty in the right place, we give her more motivation to do what her guardians want. Just like humans, motivation is important. I also recommended that the guardians practice tossing the treats on to the artificial grass independent of dog potty training. As I mentioned in the above video, I noticed that Abbey was somewhat reluctant to step onto the fake grass. It’s possible that the sensation is uncomfortable or displeasing to her. By providing a high-value treats each time that she steps on to that surface, we can help her develop a more positive association which should have an impact on her desire to eliminate there. I recommended that the guardians toss 10-15 treats onto the fake grass every day for a week or two. Abbey may temporarily start going on the astroturf for a few days then go back to the concrete. Regular positive reinforcement with the treats this way can help ensure that she gets used to and even enjoys the feeling of the fake grass. Next I was ready to bring in my secret weapon. I had the dog’s guardians put both dogs inside and close the dog door so they were not aware of what I was about to do next. It’s pretty common for dogs to pee on surfaces that have been urinated on by other dogs. Additionally dogs get a lot of information about other dogs by sniffing and licking their urine. By having Quest walk and eliminate on the fake grass, I was loading it up with scents that will appeal to and attract Abbey’s attention. I thought I had a pretty good plan in place but Quest decided to add to it and I have to admit his addition was a good one. After reviewing the footage, I concur with what I said on camera. Quest recognized that Abbey was not comfortable around him so he squirted a little urine on the floor next to her before moving away. As you saw in the above video, this gave Abbey the ability to get to know him a little bit better and also gave her the confidence to start moving around the courtyard. Once I saw her walk onto the fake grass and sniff where Quest had pee’d I knew we were on the right track. As soon as she eliminated over it, I knew that we had achieved success. Toss 10-15 treats onto the grass throughout the day (every day for 1-2 weeks) to help Abbey get used to and enjoy the feeling of the fake grass. Invite other dogs over to pee, walk, lay and roll around on the fake grass. Pet both dogs with a purpose. Take advantage of situations that allow the humans to delay gratification to develop more self control. Introduce rules and enforce them right away consistently for 3 weeks. Remember to pet or reward the dog within 3 seconds. Avoid using good girl when petting the dogs. Instead recite the command word of whatever they are doing the second they deliver the treat or affection. Clean the inside area Abbey was eliminating on with the enzyme that eliminates the scent completely. A professional carpet cleaner may be needed. Cover the inside area Abbey eliminates in for a few weeks to help her develop a new habit of only going outside. Use the escalating consequences to disagree with unwanted actions or behaviors. Teach the dogs to stay at the bottom of the steps until the human gets to the top and calls them. Add structure to meal time to help the dogs adopt a follower’s mindset. Read this dog behavior column I wrote on how to introduce dogs to a new baby.